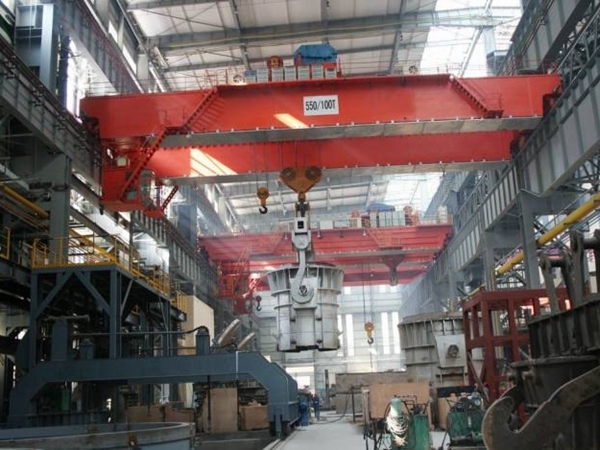 Double Girder Overhead Crane Manufacturer Provides Heavy Duty Crane Light Duty Crane! 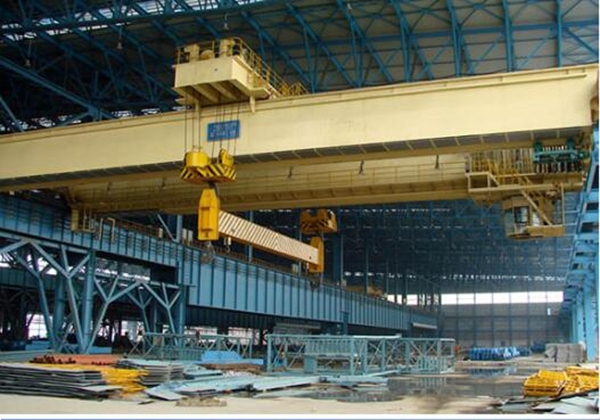 Double girder overhead crane is widely used for transferring material, goods, equipment installation and maintenance in factory, power station, storeroom, warehouse etc. It can be divided into following types according to different use standards. As a professional cranes supplier, Ellsen Group provides kinds of double girder bridge cranes with high quality and low prices to meet customers’ needs. Rope hoist helps reduce operating cost due to extended service life classification. Reliable monitoring and preventive maintenance due to advanced technology. What is double girder bridge crane with hook? 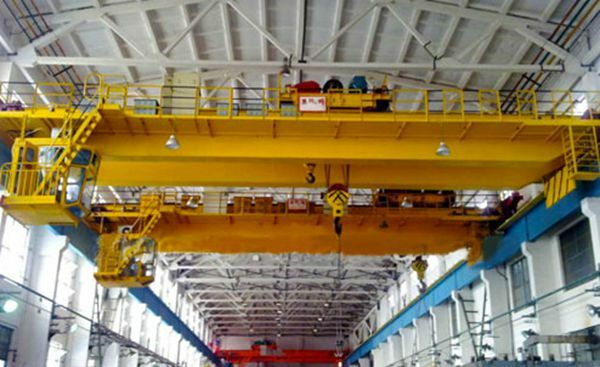 This kind of double girder overhead crane adapts to mine, factory, warehouse indoor and outdoor for general loading, unloading and transferring work. Two working classes are included: medium class and heavy class. Crane of medium class is suitable to machinery processing, metal structure, assembly; crane of heavy class is suitable to smelting workshop and continuous lifting work for heavy duty. 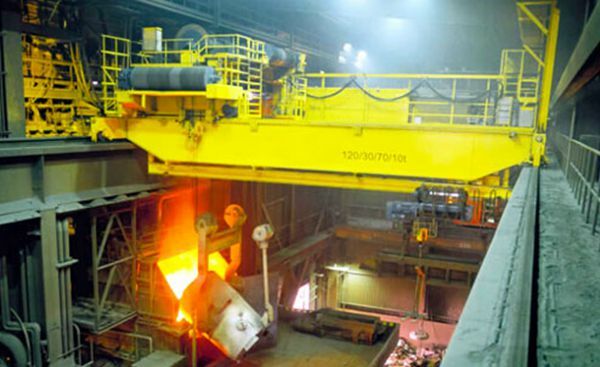 When lifting dangerous goods and scorching hot liquor, the lifting crane should be equipped with double-brake system. 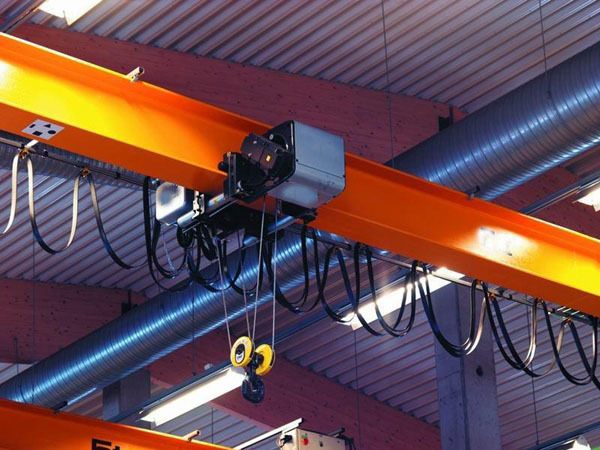 When to use grab overhead cranes? 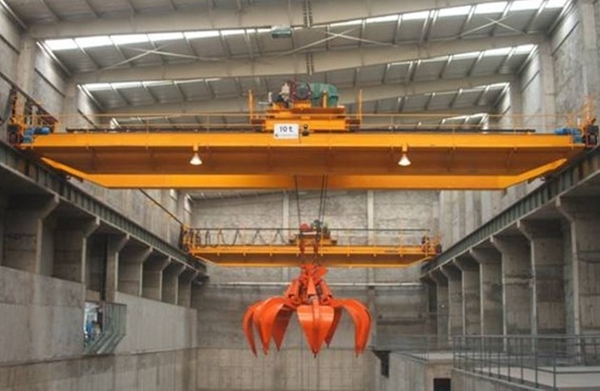 Grab overhead crane is often used in metallurgy, chemistry, cement and other enterprise’s warehouse and factory, or work on lifting bulk material such as ore, limestone, coal, sand under fixed span indoor and outdoor. It is called workstation crane. The grab system is flat grab with double drum (four ropes). The grab can close and open at any height. When grabbing solid block more than 60mm, the grab with gear is needed. The grab is suitable for bulk material under the condition of natural accumulation. If grabbing material in the water, special description is necessary. Rated lifting weight of grab overhead include the weight of grab itself and the weight of lifting material. What is electromagnetic travelling crane? Electromagnetic crane with detachable magnetic disc is suitable to steel market and cutting workshop. 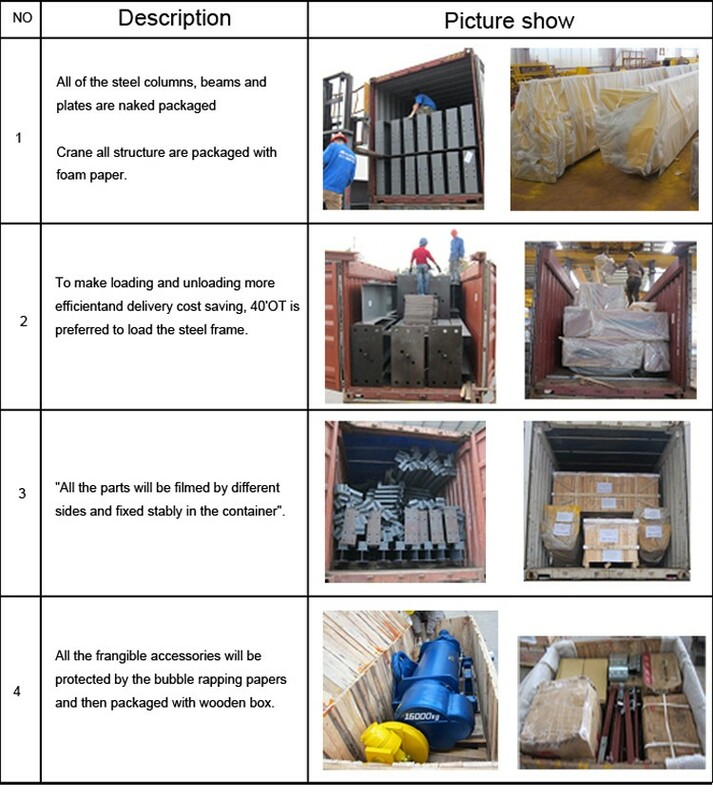 It is also used frequently for loading, unloading and lifting black metal products and material with magnetic permeability. The crane system includes box type bridge frame, travelling crane system, trolley, electrical equipment and magnetic disc. Complete mechanism is operated inside crane cabin. When using outside, the machine is equipped with anti-rain device. The magnetic disc is charged directly through cable reel on the trolley. The rated lifting weight of electromagnetic cranes refer to the weight of magnetic disc and the weight of lifting material. 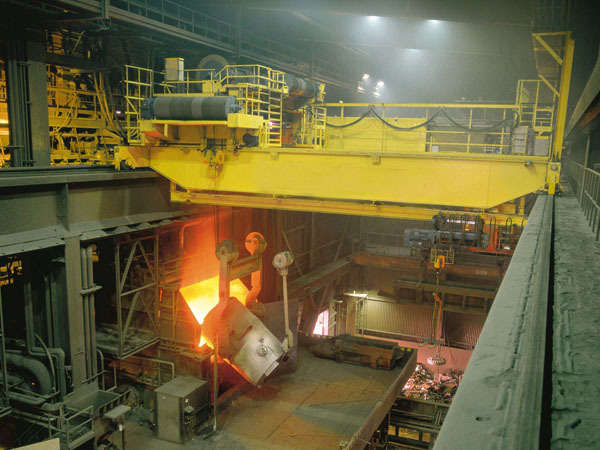 It applies to lifting work in smelting workshop and has high work class for heavy duty. Due to lifting liquid metal, it is required that when one site of electric motor doesn’t work, another electric motor can continue for a work-process. 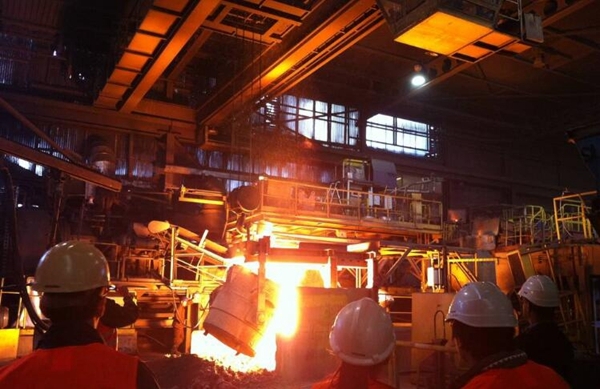 Its rated lifting weight is the total amount of lifting steel ladle and molten steel. The hook of first vice lifting mechanism can be used together with main hook to pour out the molten steel and steel slag or can be used alone to lift material. Main lifting mechanism with four wire ropes is much better, because when one wire rope or two wire ropes on the diagonal line brake, it can also unload the heavy material on the floor. 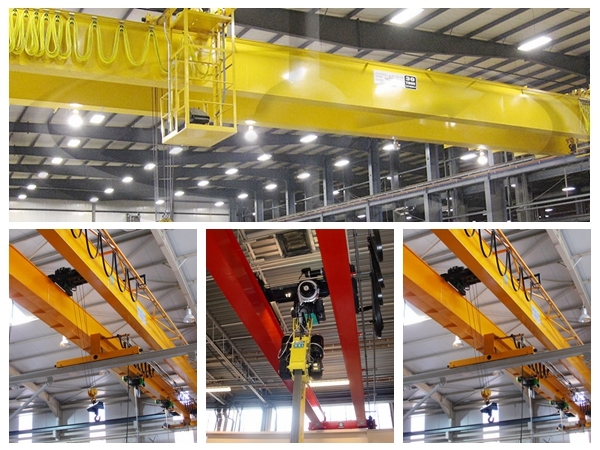 Dual-purpose overhead cranes include grab-magnetic type and grab-hook type. In order to improve the productivity, the trolley is equipped with hook and grab or magnetic disc and grab. But only one kind of lifting device can be used in every work cycle. This kind of crane includes detachable magnetic disc, grab with motor and hook. Three lifting devices can exchange for transferring finished products, bulk material or magnetic metal material. But only one type can be used each time. 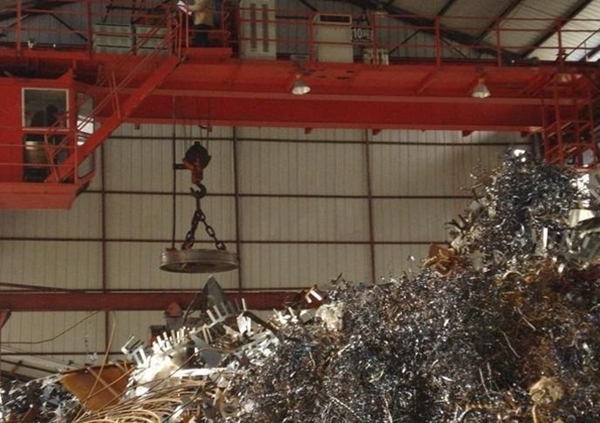 What is explosion-proof crane with hook? Overhead explosion proof crane applies to factory and warehouse with flammable and explosive mixture, usually works on general transferring duty. Explosion proof classes have two major categories: I class refers to mine crane; II class refers to factory crane. Its electric motor is explosion-proof, some explosion proof measures are also taken for mechanical parts so that crane in the work avoids producing spark, bringing fire or explosion accident. All electric motors are marked with “EX”. Explosion proof class of the crane should be chosen based on the classification of hazardous substances. There are four classes of explosion-proof as following: I、IIA、IIB、IIC. The voltage of I class is from 660V-1140V, the voltage of II class is 380V. Factories often use IIB class and IIC class( Exd IIBT4/ExdIICT4). How to make two- girder cranes insulated? 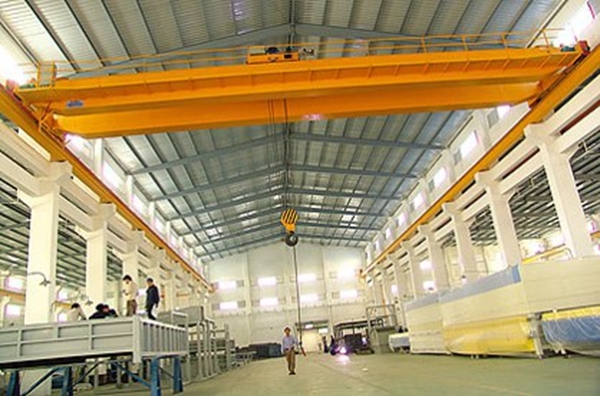 Overhead cranes with insolation are widely used in aluminum and magnesium electrolytic workshop. They apply to aluminum electrolytic factory with low voltage and high currency. To avoid that the charged objects are transferred onto crane system through lifting device and endangering the life safety of crane operator, so several insolation devices are set on cranes’ three positions. Three positions include the place between overhead crane hook and pulley, the place between lifting mechanism and trolley frame, the place between trolley frame and crane system. Low price double girder overhead crane is one of those purchases that you will know has to be made with careful precision. You cannot just put in thousands of dollars into a machine that is not going to help you with the project that is coming up on site. You want to have it be able to come in and do what a crane is supposed to do, and that is working hard and lifting heavy. 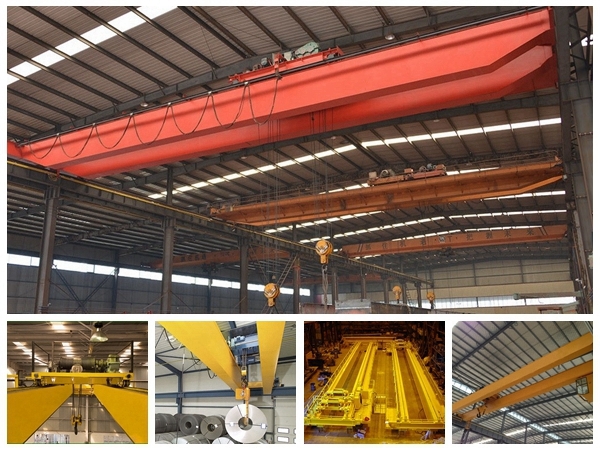 Let’s say you want to get the double girder overhead crane, where do you go? Let’s take a look. What are your project needs? You can’t just get a double girder overhead crane and assume it is going to be okay. You need it to do a particular task, and that is only going to happen when you are aware of what that task is. Once you can pinpoint this, you are going to be able to take care of all of your project needs. This is a simple part of the checklist you are going to have to make out. Once you have the project needs down, the rest will be easier. You want to look online as that is important too. When you are not looking online, you are going to get to a point where things fall apart. Be patient and see what is out there as soon as you can. You want to look online because a simple Google search is going to yield a lot for you. It is going to show a list of local and international suppliers that you can make contact with to see what they are offering. Get all of the information they provide and put it all in front of you as you make a choice. You want to start close to home even if that might not be the best solution. You want to do this because you will have an easier chance of seeing the cranes in person. Now, if there is an option elsewhere, you are going to be able to bargain your way down when you have done your homework. It is not just about getting to a good supplier; it is about paying a rate that is reasonable as well. You don’t just want a good crane that is going to cost you too much for the job. The projects that you are going to be running will require the double girder overhead crane to be in top shape, and that is all you are going to expect of it. If that is what you are going for, the reality is that you are going to need the best possible crane in the world. If that is what you need, the right supplier is important nad being able to find the best option is critical. Once you do this, you will get a crane that is going to handle your project with the utmost of ease. When you need a powerful crane and you want to make sure that the crane is going to have the strength to lift the loads you need lifted, then you need a double girder overhead crane. These cranes are extra strong and they can be used in many different situations, including factories and power stations. The double girder crane has more power thanks to the extra girder in the crane. 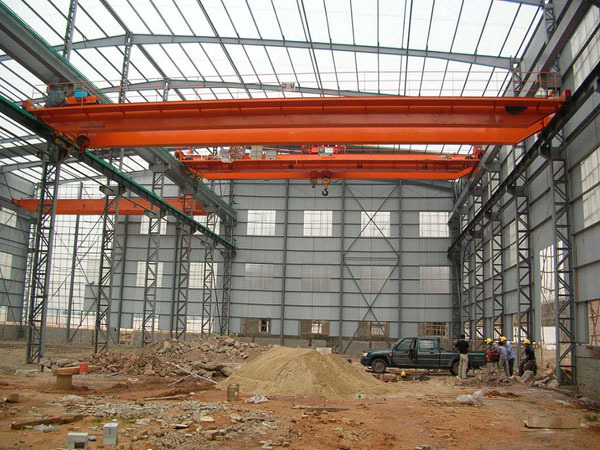 You will find the double girder crane in mines, warehouses, and construction sites. The crane works well in both indoor and outdoor situations and it can be used to load and unload goods. It is also commonly used to transfer goods. You can order the crane in either medium or heavy class depending on your needs. The medium class crane works well for assembly while the heavy class crane is called for when you need to do continuous lifting. Make sure that the heavy duty class crane has a double brake system for extra safety. If you are working in a corrosive environment, you will want to order an explosion proof double girder over head crane. This type of crane will not produce sparks so that you don’t have to worry about triggering an explosion. There are four different classes of explosion proof cranes, so if this is the type of crane you plan to buy, you will want to ensure that you order the right class. The double girder crane is extra strong and it works well for lifting very heavy loads. When you need to purchase a double girder crane, you will want to make sure that the crane can handle the amount of weight you need to have lifted. This means that you need to make sure that you know how much weight you are going to need to lift. You also need to know where the crane is going to go so you can be sure that you have enough space for it. The double girder crane can be customized for your needs which will ensure that you get the right size. The cranes are equipped with safety features as well. If the crane is overloaded or not loaded correctly, the limit switch will be tripped and the crane will automatically switch off to avoid having the crane fail. There are also special features that protect the motor from overheating. The crane can be controlled from the cab or from the ground. Having multiple ways to control the crane really allows you to operate it much easier. Make sure that the person operating the crane is trained and is familiar with all the safety features that go with operating the crane. The crane is a huge piece of equipment and you want to make sure that the loads are handled properly. The double girder overhead crane can handle huge loads and you can use it in an indoor and outdoor setting. 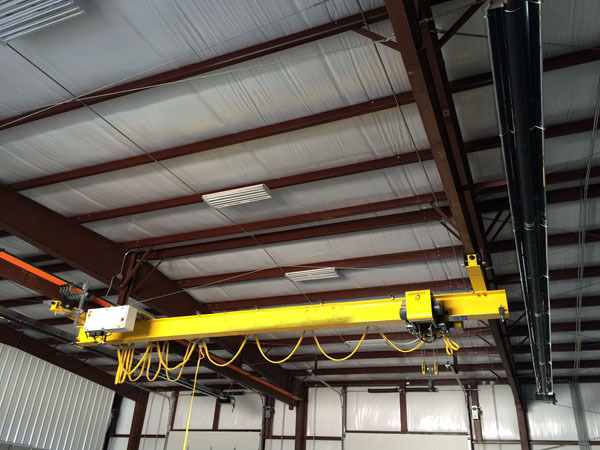 If you need to get continuous lifting done, then you need a double girder overhead crane. 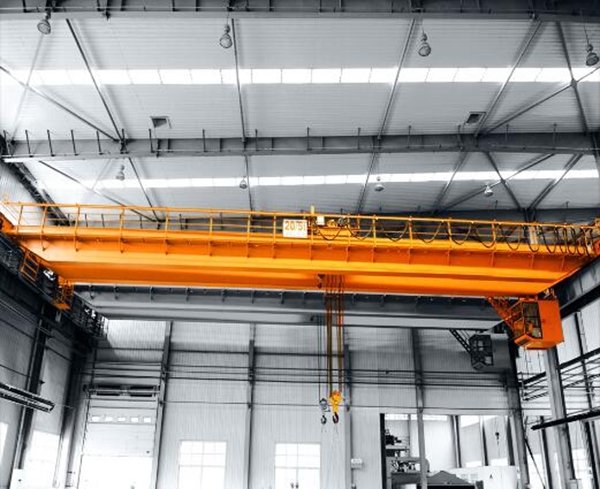 A double girder overhead crane is often preferable to a single girder overhead Crane because of how much more weight they are capable of lifting. It is the hoist that does all of the work, but by having this extra support up top, it is possible for a company to utilize it for a significant amount of heavy lifting. It is possible that you could find one that is used that is nearby, and have it brought to your location. However, it is often better to purchase them brand-new and have them installed by a professional that understands exactly how to set them up. When you do your research online, you can quickly locate businesses that specialize in this industry. They will understand how important it is to provide not only a cost-effective product, but one that is engineered for heavy lifting. They must include all of the supporting beams at the bottom, and the base plates that will keep them in place. Even if they are using the existing supporting structure, it must still have the runway beams up top, the bridge drives, trolley frame, and the hoist that can handle all of the weight. You need to compare the different prices that they are available at from reputable vendors that you will find. As long as they will have each and every component that will create a very safe and sturdy double girder overhead crane, this is likely a business that you should consider working with to have this installed. 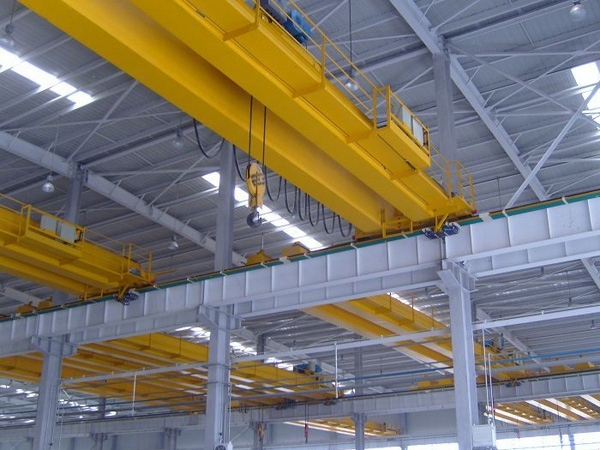 Why choose a double girder or single girder overhead crane? This decision really comes down to how much money you have to work with, and the type of merchandise that you are moving. If you are working on a shipping dock, for instance, and you need to move containers that weigh quite a bit, you will want to have a double girder up top that can support the weight. Even if your hoist is capable of lifting 50 tons or 100 tons, the stability of the crane is actually based upon the supporting beams and the girders up above. It’s always better to get one that has two girders instead of one when it comes to safety and enhanced capabilities. After you have installed one of these, you should have no problem moving the merchandise that is at your facility, going up to the maximum weight that your merchandise can be. Best of all, these are constructed to be much more stable, and therefore you will enhance the safety levels at your facility by having a double girder gantry crane installed overhead. If you are able to look at the many different models that are sold, and also the different types of hoists that can be added to your unit, you can usually have one sent to your location that will be consistent with your needs, and also fit very easily into your spending budget. An overhead crane with double girders for support is used quite a bit for the hoisting and moving of heavy machinery and equipment. It is made up of four distinct parts, a bridge frame consisting of two main girders and two end beams, a traveling mechanism, and a trolley with a frame and electrical parts. The bridge frame is composed a main girder of a box shape, an end beam, a walkway, a rail and an operating cabinet. The advantages of a double girder crane is its strength and rigid torsion capability. In addition the configuration provides for minimum wear as the connections between the girders are engineered to precise machined tolerances in order to provide for minimum wear. This makes the entire crane operation extremely stable. 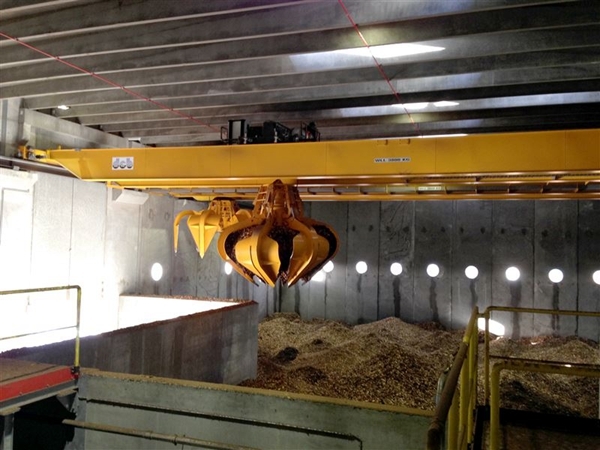 The crane is very highly cost effective too, in that it has a very low dead weight factor, and it has a very reliable monitoring and preventative maintenance capability. The exceptional load capacities that these devices offer allow for the movement and carrying capacity that are just not available in other applications. They provide extremely stable and productive operations for very heavy pieces of equipment and machinery. Double girder overhead cranes provide for a greater hook height, allowing for the transport of taller equipment. This allows for a double girder crane to have more lift as the hook is located between the cross girders, not under a cross girder. This allow for the height of the life to be 18 to 36 inches higher than a single girder crane where the lift is limited to the height of the girder itself. A double girder crane also allows for the lifting mechanism to be what is called “top running” which means that it can run along a track that is set on top of the double girder assembly, as opposed to an assembly that is located under the girder, as in a single girder crane setup. The top running setup for the overhead crane assembly is very good for handling and lifting of extremely heavy loads, particularly those that weigh 20 tons or more. With a 20 ton load or more the crane assembly is actually tied into the building’s support steel to give it added strength. A top running overhead assembly is also very useful when very high headroom is required for extremely heavy and very tall items that need to be transported. The length of the carry is also a consideration, as when the distance to transport an object is 60 feet or more, a double girder crane is the method most acceptable for use. Double girder cranes are very handy when the space between the girders need to be filled with cabs, crane lights, walkways, cable reels and other necessary types of equipment. A double girder crane also allows for two hoists to be placed on one trolley, so there can be more accomplished with a minimum of effort. Depending upon the nature and the weight of objects that need to be transferred, a double girder crane handles most of the very heavy work that is done in industry. LH type electric hoist double girder crane is a flexible lifting crane.It is designed according to national standards.The lifting mechanism adopts CD1, MD1 electric hoist. It is a kind of light and small double girder crane with traveling rails.The working class is A3-A5, the working temperature is -25-+40℃. 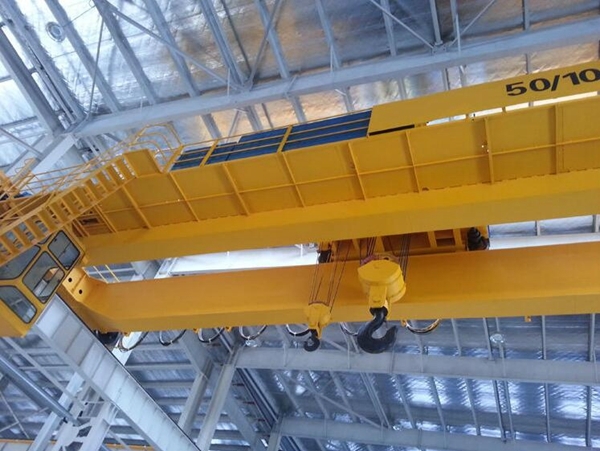 Compared with common lifting hook crane, LH type double girder crane has advantages as light weight, simple structure, easy installation and operation. 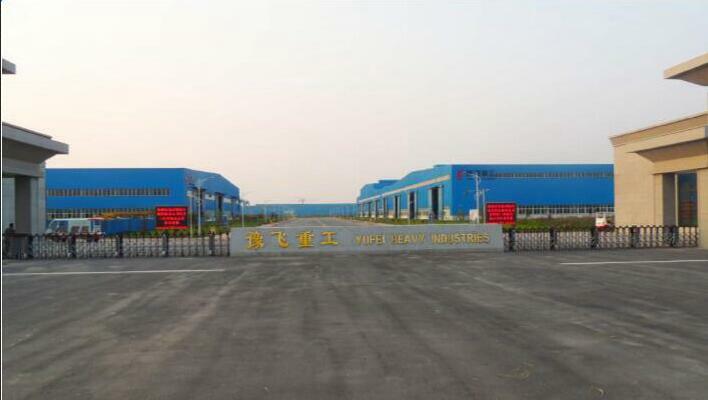 It is ideal choice for mechanical manufacturing and warehouse assembly. Electric hoist double girder overhead crane mainly accomplishes the straight lifting of material and horizontal traveling of trolley. Electric hoist mainly lifts the material. This kind of crane is composed of four parts. 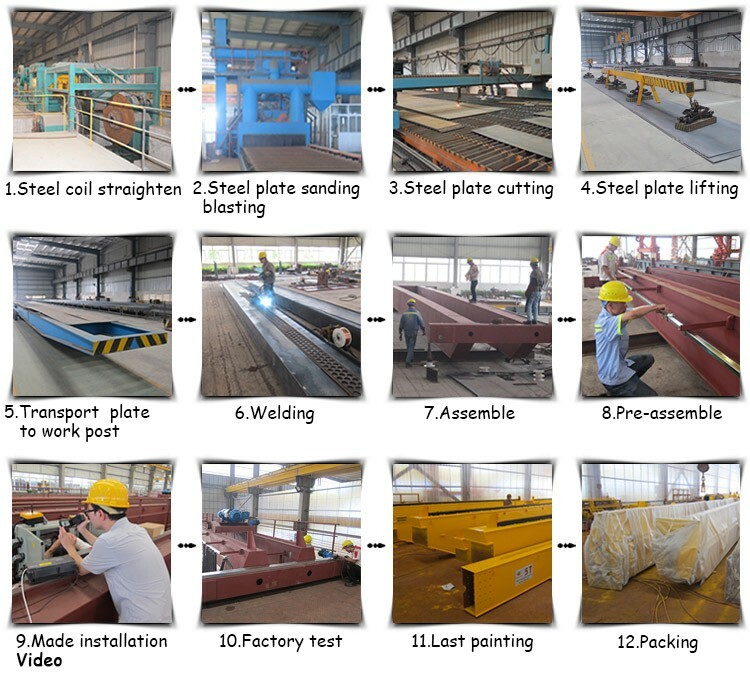 Main girder and end girder adopts thin plate. The plates are welded on the box structure. This makes crane girder convenient to store and transport. Main girder and end girder are connected by strong screws.Conductive part of trolley adopts round hanging rope slide.This kind of conductive way has advantages of reliable features, anti-dust and high safety. Main girder is set up platform, rail and conductive slide. Trolley structure mainly includes zigzag trolley frame and traveling driven device of lifting hoist and trolley. The lifting mechanism adopts CD1,MD1 electric hoist. 5-10t traveling mechanism relies on two conical brake motors. 16-20t trolley traveling mechanism adopts YSE electric motor concentrate drive.There are platform and rail next to longitudinal beam. It is convenient to maintain electric hoist and traveling mechanism. The crane adopts separate driven form. 5-10t drive brake adopts conical brake motor. Compared with crane traveling mechanism, this kind of structure has advantages as easier installation and lighter weight. The crane traveling drive of 16t and 20t adopt YSE electric motor and horizontal reducer drive. It has stable drive and compact structure. The brake device is not necessary, because YSE electric motor includes brake device. Crane electrical operation parts include three types, cabin operation, ground operation and remote operation. Electric hoist lifting and travelling adopt contact control. With remote control and ground control, the crane control adopts contact control. With cabin control, the crane control adopts CAM controller with gear position. 1.The test: with no load, put through power supply, check the transmission mechanism, control system and safety devices to make sure all devices sensitive, correct, safe and reliable. 3.Never lifting material tilt along the main girder. 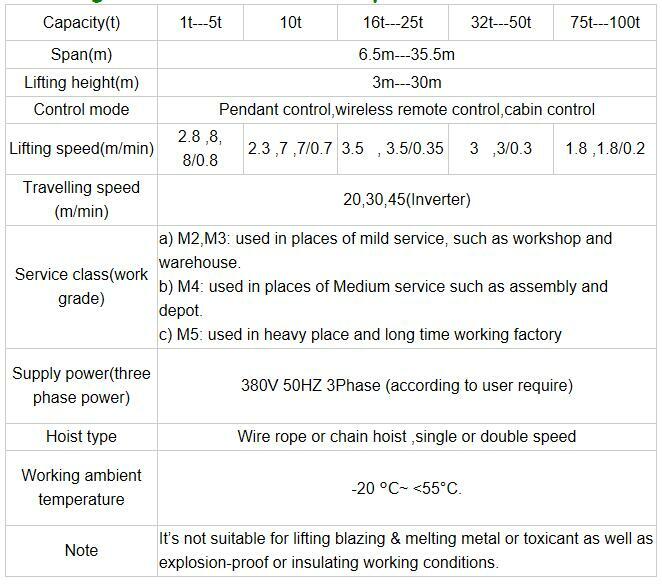 4.For special condition, such as inflammable and explosive environment, the crane should be matched with particular hoist, such as explosion-proof hoist, metallurgy hoist.